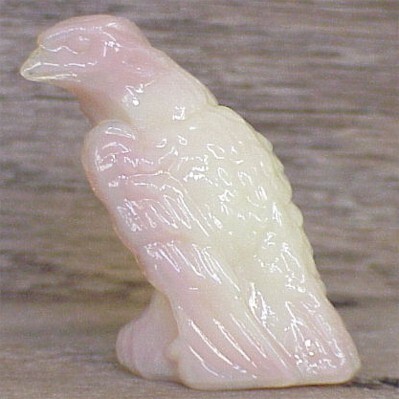 Bernie the Eagle in Ivory Blush, Bargain Shack offers Boyd Glass, Mosser Glass, L.G. Wright, and Contemporary Collectible Glass including Vaseline Glass - J.B. Scottie Dogs, Pooche, Animal Covered Nests, Toothpick Holders, Salts, Glass Animal Figurines, Clowns, Dolls, Slippers, Vehicles, and More! This is Bernie the Eagle in Ivory Blush. Bernie Eagle was officially retired in 1999 and is now only produced one time a year as an Annual Collector's Edition. This is the 2001 edition with a production date of July 26, 2001. Bernie Eagle stands 2-1/4" tall and just look at the wonderful detail! The Boyd diamond B trademark logo with 4 lines appears on his back tail feather.